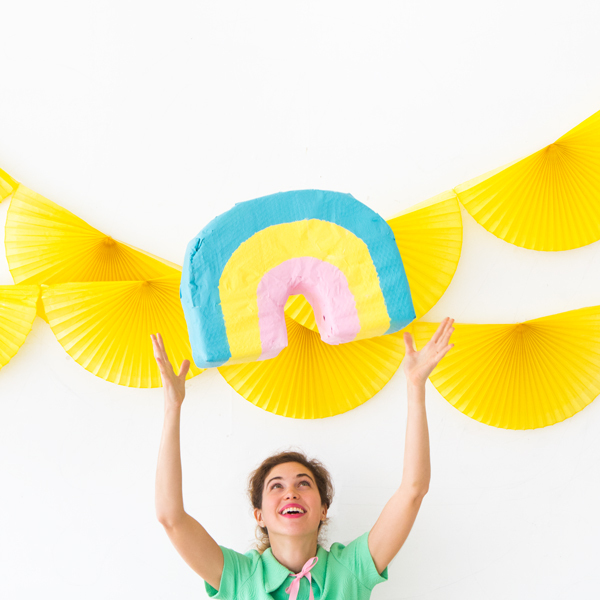 These pinatas are an homage to everyone’s favorite cereal (there is a debate going on in the Oh Happy Day studio about what cold cereal actually claims this title.) This post isn’t sponsored, we just love the magically delicious cereal of our youth. 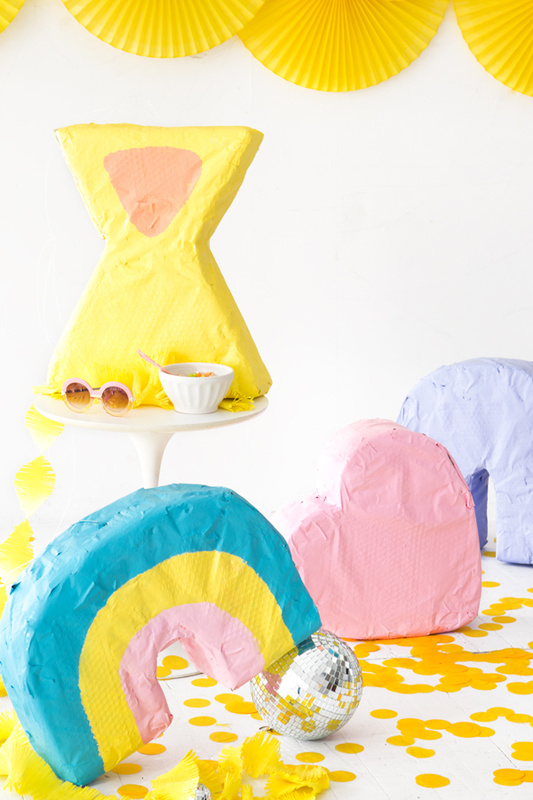 We gave these pinatas an extra padding so they feel marshmallow-y. Perfect for St. Patricks Day. The best part about these is the actual marshmallows themselves aren’t “perfect” I mean let’s be honest, some of the marshmallows in the cereal are so misshapen they are recognizable. So fortunately the marshmallow “shape” is a little forgiving. These would be fun to keep around as decoration if you can’t bring yourself to break them open. 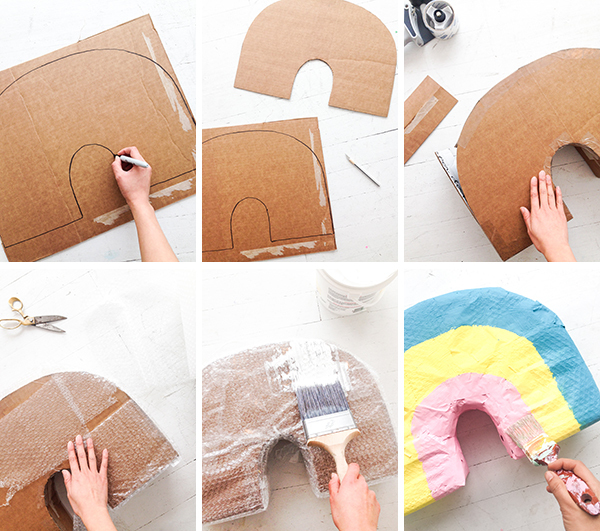 Step 1: Sketch the Lucky Charms marshmallow shape onto a large piece of cardboard with pencil. Roughly 17” in dimension. Step 2: Cut out the shape with an x-acto knife. Then, trace the piece for a mirror image and cut out. Lay the two pieces on top of each other and trim until even. Step 3: Cut long strips of cardboard 4” wide. Tape the strip along the outer edge of the cut out with packing tape. Then, tape the mirror image on the other side. Be sure to leave a trap door you can fill with fun surprises. Step 4: Wrap the pinata with one layer of bubble wrap and secure with packing tape. 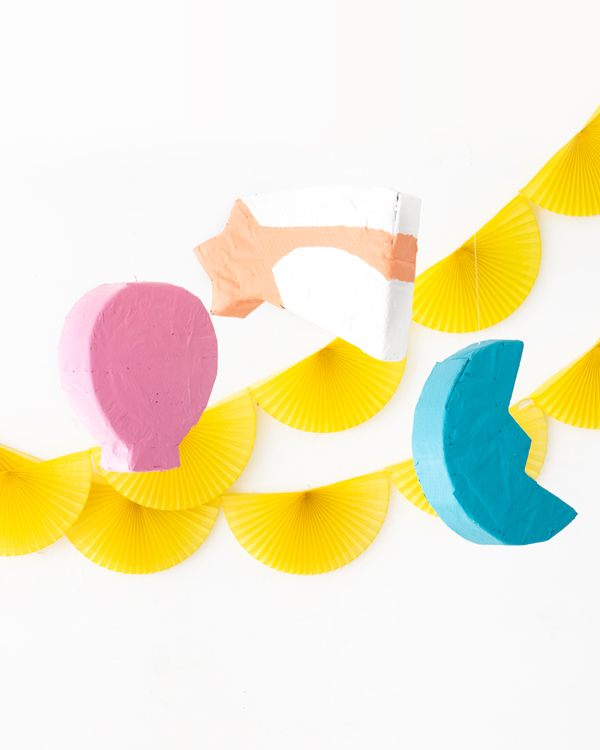 This will give the pinata a rounded, marshmallow-like shape. Be sure to tape down any openings and flaps for a smoother finish. Step 5: Paint a coat of gesso onto the pinata to cover up the layer of bubble wrap. 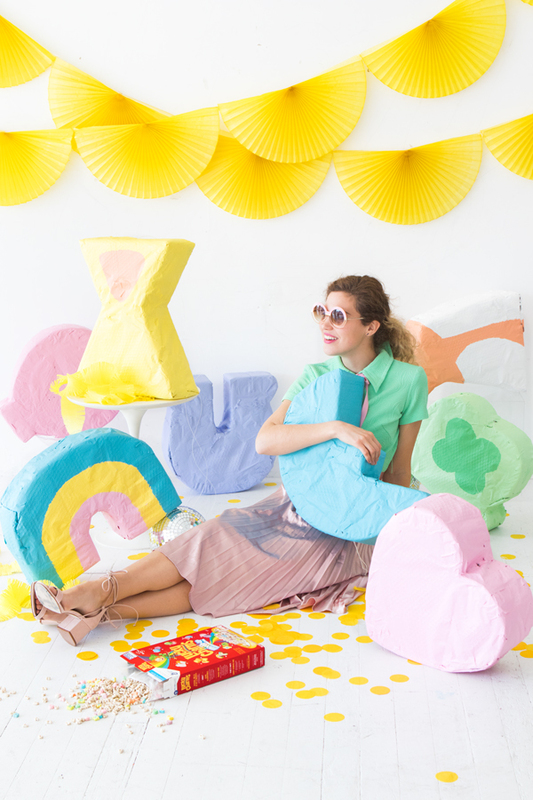 Then, paint the pinata to match the actual marshmallow pieces using photos for reference. Let dry completely. Step 6: Make a small “X” with an x-acto knife on the top of the pinata. Cut a piece of cardboard about 3” by 3” and cut a small “X” on that, too. Cut a piece of fishing line about 30” long, then thread both ends through the two holes, leaving the loop exposed and the cardboard square inside of the pinata. Tie the ends together and tape to the square piece. 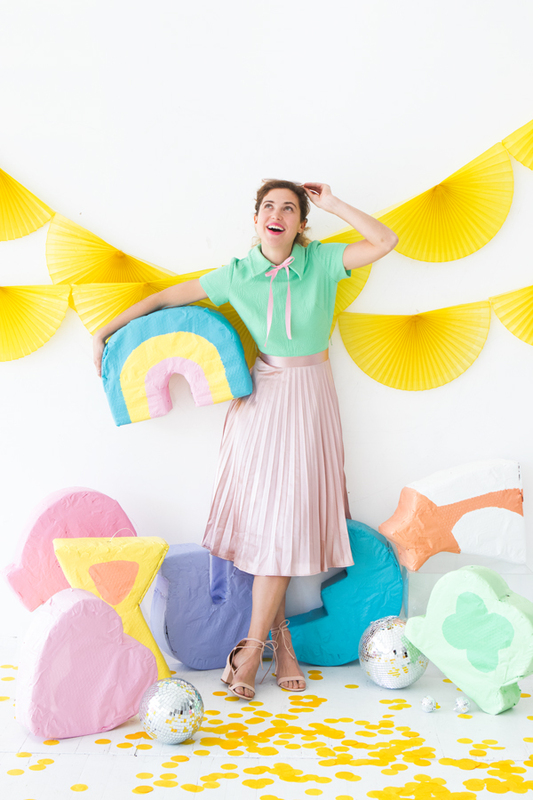 Step 7: Fill your pinatas with candy, toys, and confetti! Tape the trap door shut when you’re all done. What a cool idea, and they look so cute! Love the colours! I love this. You should fill them with lucky charms. It doesn’t get any cuter than this!! 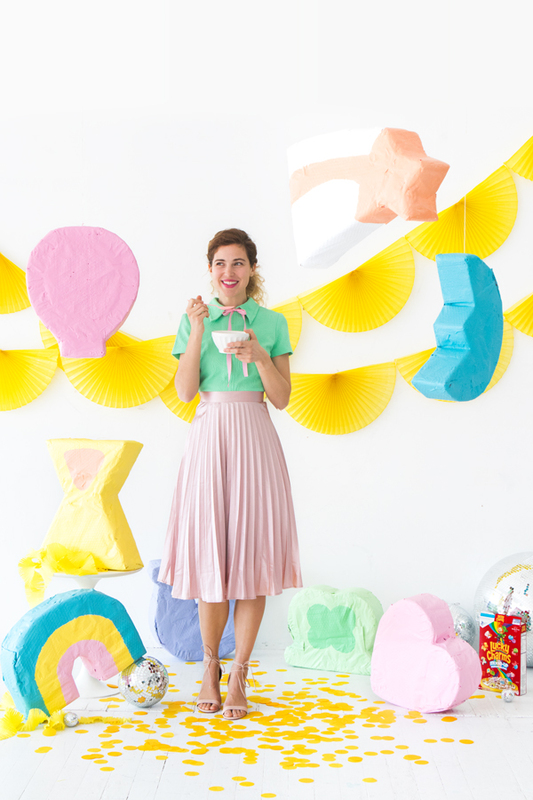 What a great idea for a b-day party!! 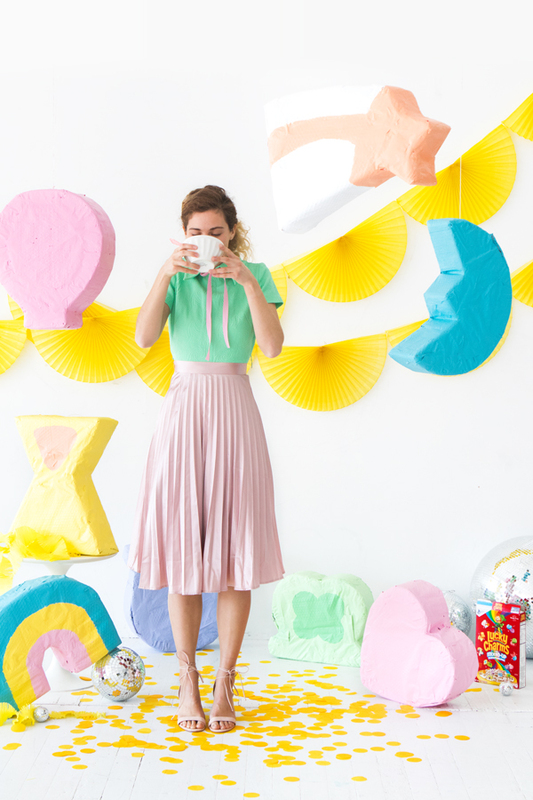 These pinatas are so cute! You all seriously have the best ideas! Super duper cute! 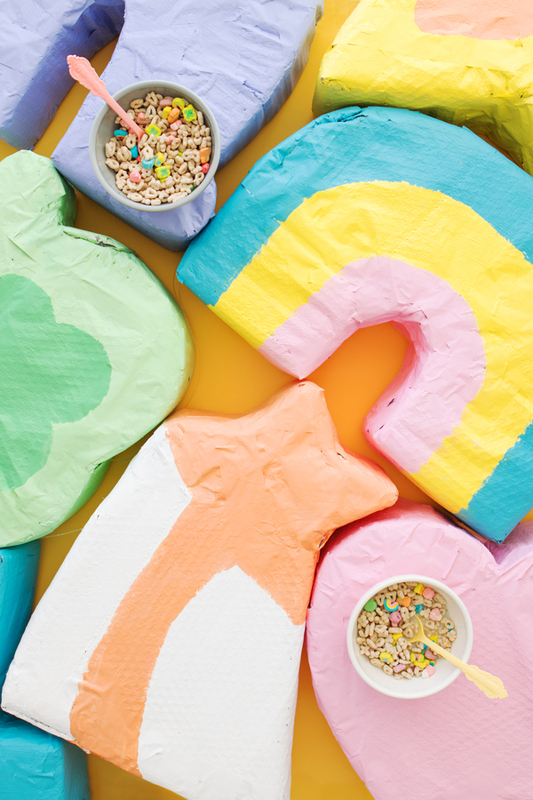 I’d never thought of having a “Lucky Charms” theme. I wish we had Lucky Charms here in Australia! Occasionally I’ll see a box of them in an American candy store, but they are often extremely overpriced. I really do want to see what all the hype is about though, perhaps one day I’ll treat myself! I’m dying to know where these shoes came from. They are absolutely lovely!